Transfer from your hotel by air-conditioned vehicle. 09.30 Depart from the pier and head to Phang Nga Bay by cruiser boat. 10.20 Arrive in Phang Nga Bay. Proceed to explore sea caves, sea tunnels and hongs by sea canoes. 12.30 Return to the cruiser and enjoy a fantastic Thai buffet onboard, while slowly cruising to Lawa Island. 13.30 Swimming, self-paddling or sunbathing on the beach at Lawa Island. 15.00 Return to Phuket. Then transfer to hotel. Just a few miles north-east of Phuket, located in the Andaman Sea, you will find the enchanting Phang-nga Bay. The bay lies between the island of Phuket and also the mainland of the Malay peninsula of Southern Thailand. More than 100 islands make up Phang-nga. Their geology is truly unique to each of these island. They range from low lying to sloping hills to limestone karsts rising dramatically from the emerald sea. The spectacular landscape of Phang-nga ensures that this is a world famous landmark. Phang-nga is the fantastic setting for many unforgettable tours and activities. 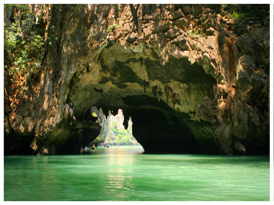 When you visit Phang-nga, you can be assured that there is an abundance of magical things to see and do. This is an ideal tour destination for all the family - both young and old.